When John Lennon first met Yoko Ono he experienced a rare moment of cosmic connection. Invited to climb a ladder at the Indicia Gallery in London, where Ono was preparing a conceptual art exhibit, he used a magnifying glass suspended from a string to find the word “yes” inscribed in tiny writing on a canvas on the ceiling. The installation was simple. Yet the effect of the Nov. 9, 1966 encounter was enduring, and the affirmative power of this story has held up through countless retellings and lives on, like the legend of John and Yoko, as part of our collective cultural history. For Lennon, it was a seminal moment. From his subsequent relationship with Ono he derived fresh energy and inspiration. While distancing himself from the Beatles and all they had become, he did not move away from his music but rather toward something bigger – art as social activism. In short, he decided to stand for something, melding his music with Ono’s talent for performance art to promote causes such as world peace via Bed-Ins in Amsterdam and Montreal. At its best, conceptual art provokes thought, and Save the Date, an upcoming performance by Kathryn Cornelius at the District’s Corcoran Gallery of Art is already promising some mind games. From 10 a.m. to 5 p.m. Saturday, Cornelius will explore “the life cycle of marriage and divorce and the wedding ceremony’s complex mix of private emotion, public spectacle, social expectation, and state power” by getting married to, and divorced from, seven consecutive suitors – male and female – who have proposed to her online. It's a kind of Bed-In for our age. Whatever you think, Cornelius promises to make you think. I think John and Yoko would approve. If you’ve ever seen My Big, Fat, Greek Wedding, you’ll recall the patriarch’s love affair with Windex, which he used to clean his glasses, hands and car and prescribed as a cure-all for a variety of ailments and skin blemishes. But if you’ve ever lived in the Middle East – or even stopped by – you’ll know that the real big gun in the household arsenal is not the beautiful blue window cleaning spray, but a screw-top bottle filled with a yellowish liquid that turns cloudy on contact with water: Dettol, a product with almost limitless powers. This distinctively-scented antiseptic is used in its various forms to clean toilets, floors and kitchen counters, wash dishes, rinse vegetables and fruit, disinfect cuts, bites and wounds and as a gargle for sore throats. It also comes fetchingly packaged as a bar of yellow soap, great for washing people, pets and clothing. And let’s throw in curtains and upholstery, too, for good measure. (A visit to Dettol’s website reveals it’s now being marketed in multiple forms, from disinfectant wipes to hand sanitizer). 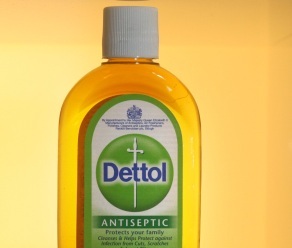 Last week an Arab friend was reminiscing about Dettol, which is manufactured by Reckitt Benckiser, an Anglo-Dutch household products and drugs group, and was in 2011 ranked as the 48th most trusted brand in India by The Brand Trust Report. Yes, India, which is one of the world’s top 10 economies. So that’s a pretty big deal. Anyway, Mahmoud remembered his mother daubing his skinned knees with diluted Dettol on a cotton ball, while the maid used it to mop the floor and his father poured it into the toilet bowl. So if you are a cane toad, or even remotely resemble one, steer well clear of the Middle East if you value your life. You have been warned. And for all the rest of you human beings, forget about the Windex.